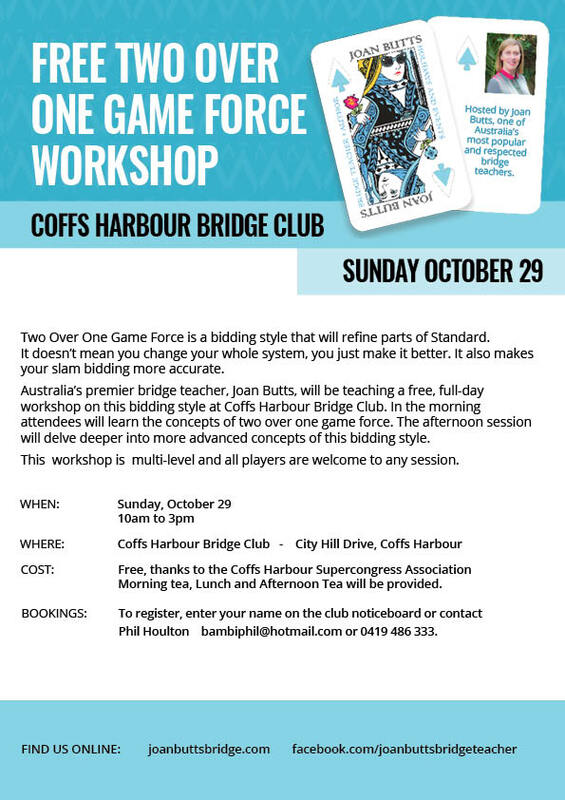 Australia’s premier bridge teacher, Joan Butts, will be teaching a free, full-day workshop on this bidding style at Coffs Harbour Bridge Club. In the morning attendees will learn the concepts of two over one game force. The afternoon session will delve deeper into more advanced concepts of this bidding style. This workshop is multi-level and all players are welcome to any session. Free, thanks to the Coffs Harbour Supercongress Association Morning tea, Lunch and Afternoon Tea will be provided. To register, enter your name on the club noticeboard or contact Phil Houlton via bambiphil@hotmail.com or 0419 486 333.